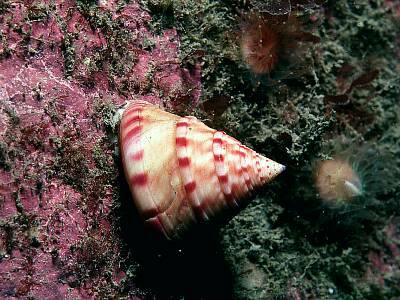 Description: This topshell has a straight-sided conical shell, usually with markings in pink and red. A white form lyonsii is common at some localities, especially in strong tidal streams. Habitat: Predominantly a sublittoral species, almost ubiquitous on rocky substrata where it feeds on a variety of sessile invertebrates, especially hydroids. Distribution: Widely distributed all round the British Isles. Similar Species: Juveniles could be confused with other topshells such as Clelandella clelandi. Picton, B.E. & Morrow, C.C. (2016). Calliostoma zizyphinum (Linnaeus, 1758). [In] Encyclopedia of Marine Life of Britain and Ireland.